When you make tea from loose tea rather than using a teabag, you can take your pick from some very cute tea infusers. Simply add the right amount of loose tea leaves then immerse the tea infuser in very hot water. The honest answer? Let it infuse for as long as you wish, depending on your personal preference. Some people like to dunk the infuser in a few times for a very mild, subtle flavour while others let the tea infuser sit in the water for 10 minutes. It just depends how strong you want your tea to be, and also what variety of tea you are using. Even if you rarely drink tea, you might have guests who do, and then that’s when a single-serve sized tea infuser makes perfect sense! Now let’s take a look at some of the best and most cute tea infusers on the market to see which one you can imagine in your kitchen and which you like the best. If fruit teas are among your favourite beverages, consider this cute citrus-themed tea infuser which looks great in your kitchen if you want to keep it on display. Add your favourite orange or lemon flavoured tea leaves and immerse the tea infuser in hot water until the tea is strong enough for your taste. There is nothing limiting you to only citrus teas though. 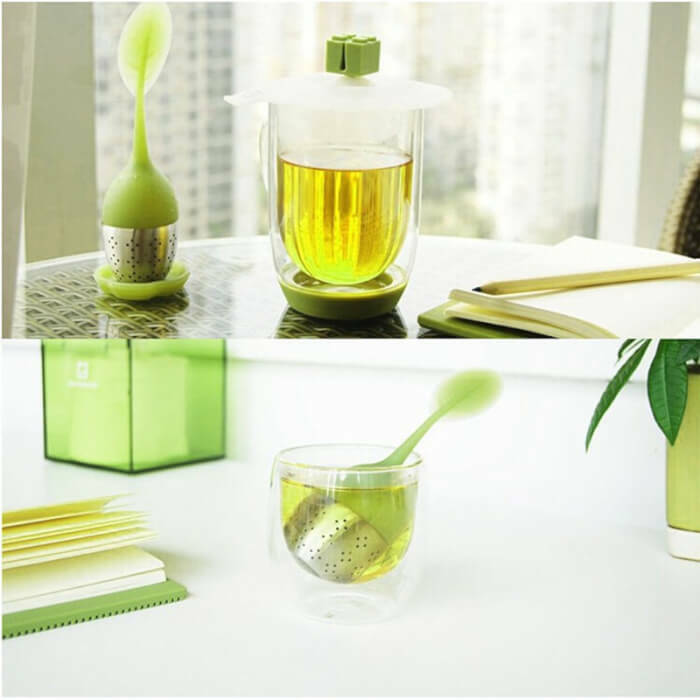 Feel free to use this cute tea infuser with any type of tea leaves. These are sure to put a smile on your face every time you decide to use them. If you’re looking for a cute tea infuser with piles of personality, they don’t get much funnier than this! Let Mr Tea take charge of your favourite tea leaves and then submerge him waist-high in hot water. He won’t complain. He will just sit there enjoying his soak while your tea leaves release their aromatic flavour into the water, thereby creating the perfect and most delicious cup of tea for you to enjoy. Take your pick from various colours of Mr Tea, or else why not invest in a few of these? Are you stuck in the Dark Ages when it comes to modern methods of brewing your favourite beverage? Are you a dinosaur, spending too much time and effort in getting that brew just right? If so, let our brachiosaurus-inspired tea infuser come to your rescue. Fill him with tea and seal, then brew your tea for the right amount of time. 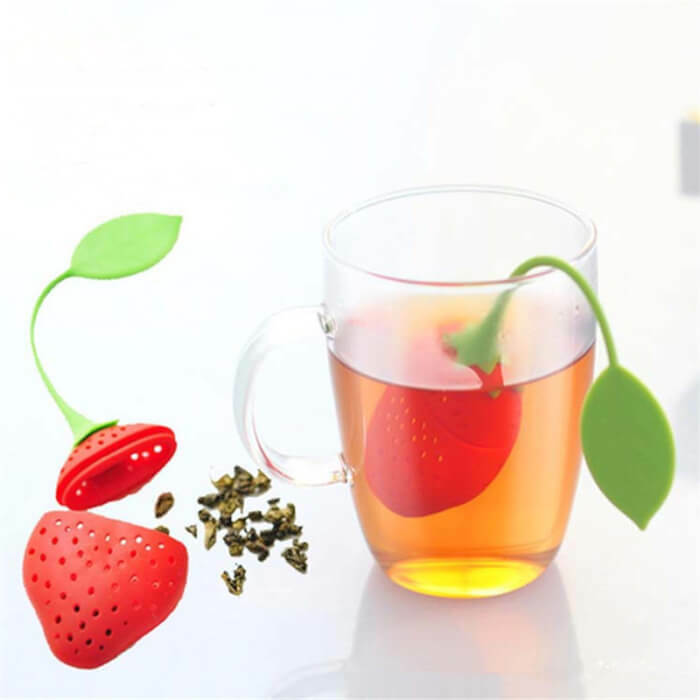 This cute tea infuser seals tightly so you won’t get any annoying little bits of tea leaves floating about in your brew. This one comes in three colours so you can take your pick. This useful tea steeper is for the discerning tea drinker who is looking for something reliable, sturdy and of course functional. The lines on the silicon leaf make it easier to grip while the silicon bottom holds your tea leaves safely while your drink brews. Each one of these comes with a matching drip tray so you can simply remove it from the cup, pop it on the tray and enjoy your tea. Choose from blue, red, green, orange and yellow, depending on the colour of your kitchen or simply your favourite colour. I think ‘owl’ be having a cup of tea now! Anytime will be teatime if you get yourself one of these super cute tea infusers. 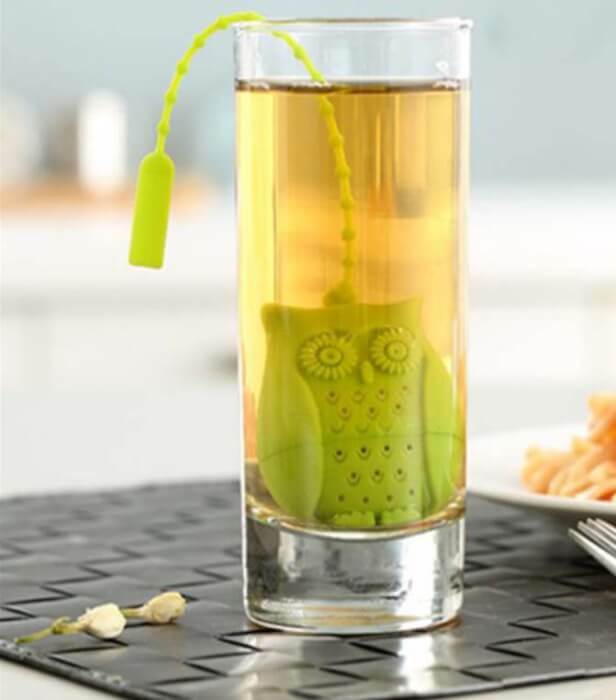 Shaped like an owl, a favourite animal of many people, this infuser is really special. Do you prefer this one in orange, green, blue, pink, grey or red? Get one of each if you can’t decide. These are non-stick and easy to clean after use. They are made of highly flexible silicon material and they’re dishwasher safe too. The top and bottom of the owl fit snugly together so no leaves leak out. Sweeter than candy on a stick, if you had a choice this would be your pick! Who doesn’t love all things candy sweet? 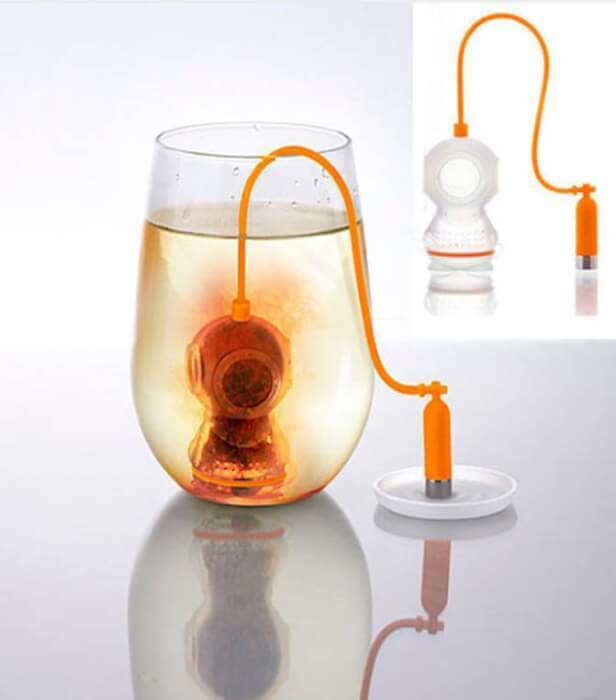 This cute tea infuser is sure to turn heads. Invite some friends over and give each person a different colour. It is a talking point for sure. Red, brown, pink, green or orange – they all help you make great tea. 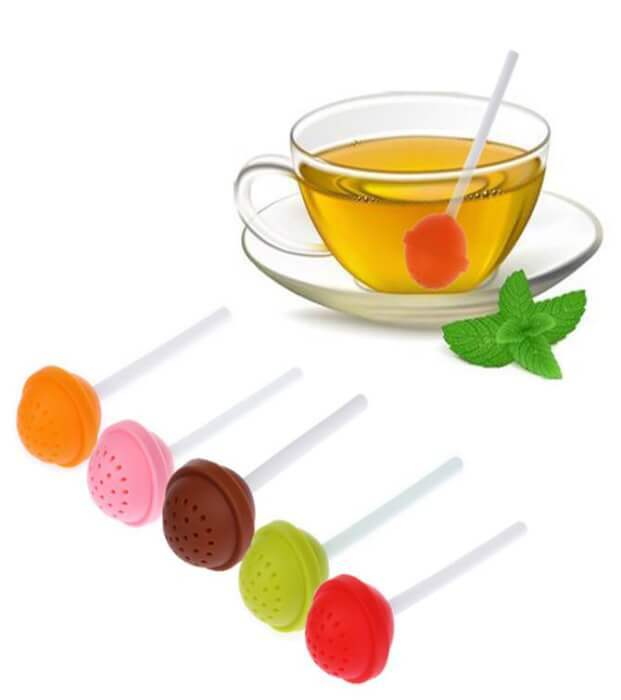 This lollipop tea infuser can be used with any kind of loose tea leaves, and the parts fit tightly together. 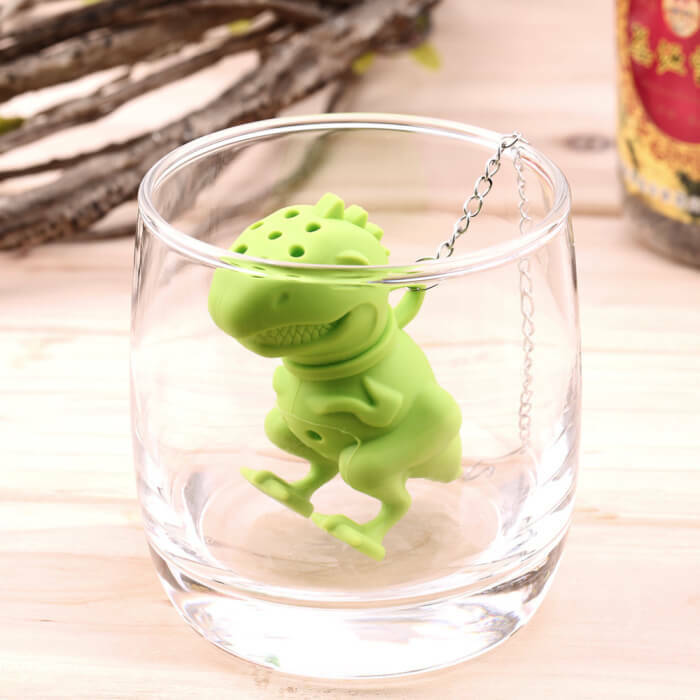 If you aren’t sure which cute tea infuser is for you, make this one a contender! Cute tea infusers come in many shapes, sizes and colours. You can also get different animals, anything from a dinosaur to an owl. But what about choosing an animal that actually belongs in liquid? This is where our cute seahorse tea infuser is perfect! Seahorses spend their days swimming gracefully in the sea. But this delightful one, which comes in green, blue, brown, pink or yellow, feels more at home floating in hot water. 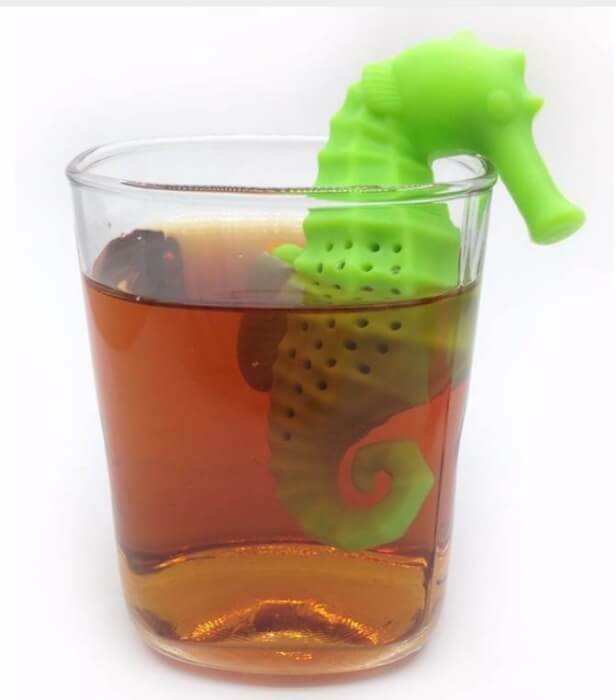 Together with this seahorse tea infuser, you can make the most perfect cup of tea. What’s the first thing you notice about a squirrel? Well, apart from the fact he wants to steal your nuts. His big, bushy tail of course! That’s what inspired this tea steeper. The bottom part is shaped like a big, bushy squirrel tail and that’s where you put the tea leaves you are going to steep. Choose blue, brown or orange, and enjoy this new, fun way to brew tea. 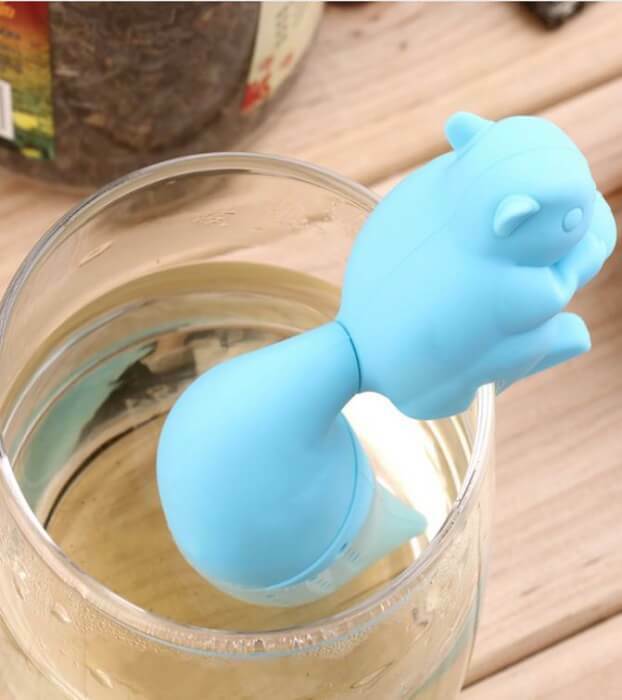 Forget the old-fashioned way of using a teapot and instead use this squirrel tea infuser. It’s ideal if you only want to make one cup of tea. One of the most popular and cute tea infusers of them all, this deep sea diver is sure to bring a smile to your face each time you use it. Available in blue, grey, green, sky blue, red, pink, orange, purple and even clear, this is a great buy. Deep sea divers (and deep tea divers) were born to submerge under the waves, and this one isn’t going to let you down. This will be a fun addition to your kitchen. Made of food-safe, BPA-free silicon, this deep tea diver is sure to always bring the fun into tea preparation. Still undecided? 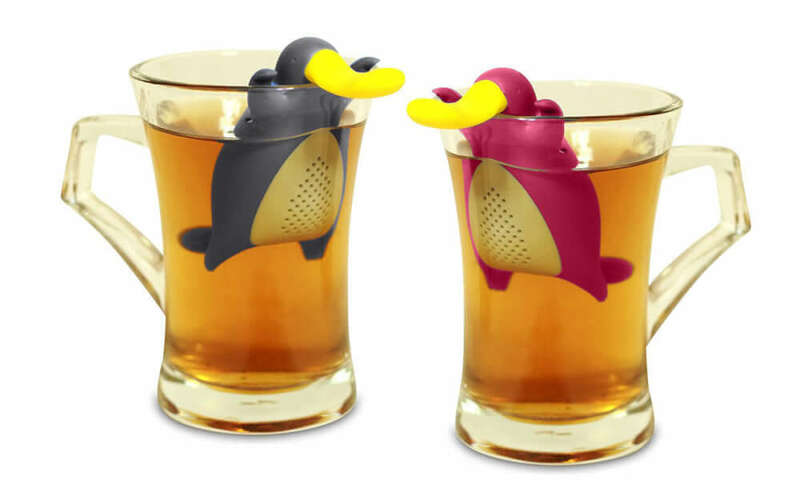 Take a look at these cute tea infusers. This modern silicon design comes in different shapes, each one cuter than the last! Choose from a submarine, squirrel or another design. Pick out a colour. Are there several tea-drinkers in your family? If so, go ahead and get everyone their own. The wide variety of designs and colours means everyone will remember which is theirs. After use, empty out the used tea leaves and either rinse the tea infuser to clean it or just pop in in the dishwasher for easy cleanup.